Lavender is one of my favourite flowers with its beautiful scent and subtle colour tone. A lavender theme is perfect for a rustic country or garden wedding and fresh or dried lavender can be incorporated throughout the wedding theme, including the invitations and wedding breakfast stationery. 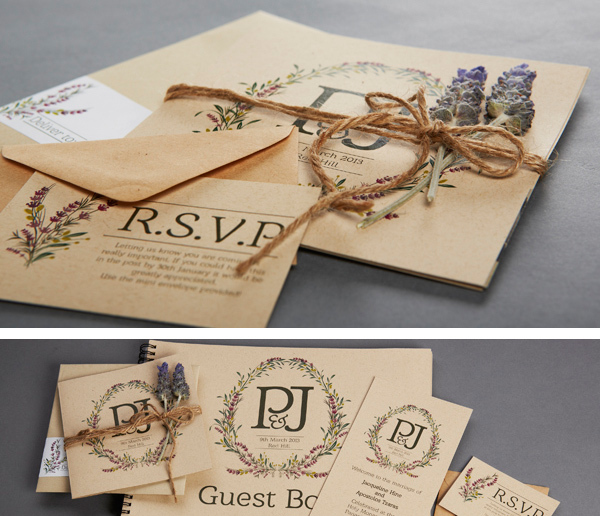 The ‘Lavender Love’ wedding stationery suite has a rustic lavender motif is its central theme and is tied with twine. You could add a fresh or dried sprig of lavender for a special rustic feel and the whole invitation would give off a beautiful scent when your guests open the envelope! Or if you prefer, you could add a personalised tag with the lavender motif or personalised stamp. The back of the envelope is printed with a personalised ‘stamp’ incorporating the lavender motif, bride and groom names, wedding date and venue. The stamp would be ideal for a rustic destination wedding, perhaps a rustic French chateau! Add RSVP, or insert cards with gift list, directions or accommodation information for your guests. 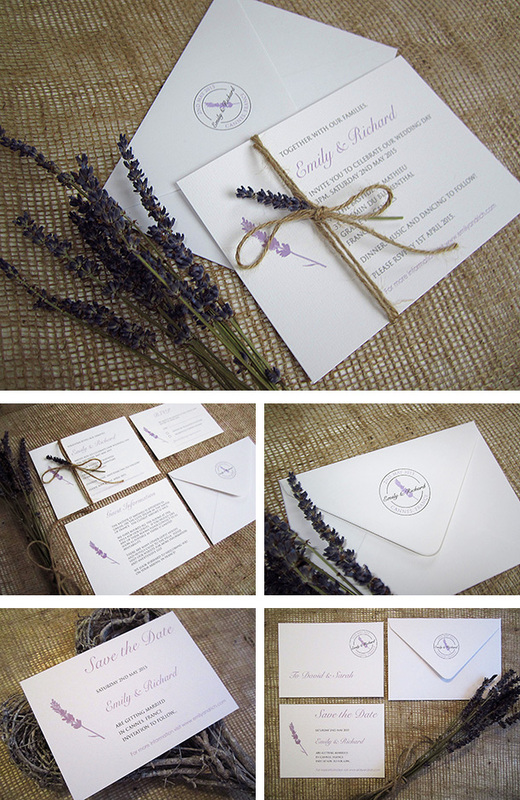 ‘Lavender Love’ is also available in a pocketfold style, with hessian belly band and tied with twine and tag. 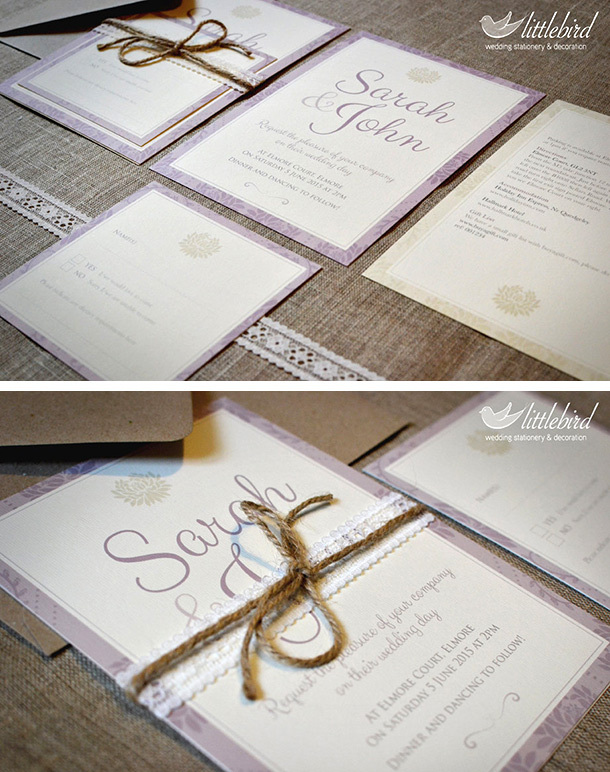 Another beautiful rustic design, also incorporating twine and lace, is by Little Bird Design. I just love the colour of this invitation suite as well as the typography. The invitation, details card and RSVP can be bought together as a bundle from £3.50. If you are looking for a tactile, luxurious finish to your invitations then look no further than this stunning lavender letterpress suite by Artcadia. This custom design has been produced as a two colour letterpress print onto 425gsm Bockingford cotton paper and really captures the true tone of lavender. One of the best ways to incorporate your lavender theme is at the wedding breakfast where the beautiful scent and rustic charm of fresh lavender can really shine through. Add springs of lavender to your menu settings, wedding favours, table decorations and table seating plan. Wrap in twine or string for pure rustic charm! Lovely!